Halloween is both a secular and religious holiday. It is celebrated on October 31. Although countries all over the world celebrate Halloween or a form of it. Christian churches may celebrate All Hallows Day or All Saints Day. 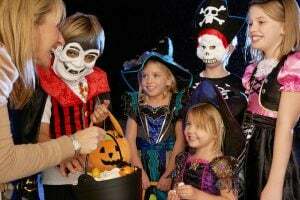 The secular celebration is marked by dressing up in costumes and trick-or-treating and carnival style events characterized by spooky elements such as ghosts. The original source of Halloween is believed to be of pagan tradition, although many believe the Christian celebrations came first. These festivals often honored gods of fruits, such as the Roman Pomona. Others, like the festival of Parentalia, may have honored the deceased. The Celtic festival of Samhain is of major influence, which marked the end of summer and the harvest. Bonfires were lit, often to provide light for those bringing in livestock from the fields or mountains to be slaughtered for winter. On this day, the Celts believe that the door to the underworld was opened, letting in spirits. 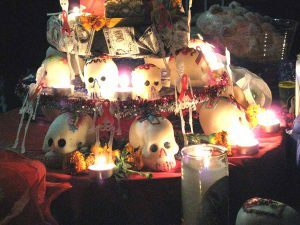 They would hold a feast, setting a place for any deceased relatives, as they were believed to visit home on this day. Mean spirits entered the earthly realm as well. People would dress in costume in order to confuse these spirits. This evolved into the custom of visiting houses to collect food for the feast while in costume, a precursor to trick-or-treating. There were several legends associated with Samhain due to the believed opening of the underworld: The body parts of those who had died since the last Halloween would become animated and possess the living. This is why many observers would extinguish fire inside of their house and purposely make it very cold so that spirits would not be drawn there. 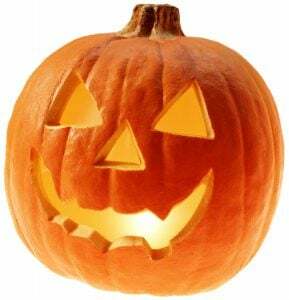 Jack-o-lanterns were carved to light nighttime paths and protect from these evil spirits. The carved pumpkin’s namesake comes from the legend that a boy named Jack paraded through the town with a pumpkin in which he’d trapped the devil. The devil curses Jack upon his release and condemns him to spend forever in hell. When the gates open on Halloween, Jack would escape hell to wreak havoc upon the town. The Jack-o-Lanterns were supposed to trick Jack into thinking it held the devil, scaring him off. Halloween also borrows elements from the Christian tradition. The name comes from All Hallows Eve, the day that Christians spent honoring the deceased and the saints. As a Holy Day of Obligation, some observers honor those in purgatory by ringing bells. Many Halloween traditions come from a mixture of these Christian and pagan traditions. The influx of Irish and Scottish immigrants during the 19th century brought the celebration to America. The traditions and imagery of Halloween are largely adopted from horror stories and gothic works—ghosts, vampires, other monsters, haunted houses, skeletons. Some community events may also be held to celebrate. At the Cathedral of St. John the Divine, New York City holds the Halloween Extravaganza and Procession of Ghouls. The event screens a horror film and then holds the procession, which features many extravagant costumes. Trick-or-Treating is the practice of children dressing up in costume to ring doorbells for candy. When the door opens, they will say, “Trick or treat? Give me something good to eat,” which is sometimes followed by, “if you don’t, I don’t care, I’ll pull down your underwear!” Some children may opt to collect for charity, such as the UNICEF coin boxes that observers can donate change into as the child collects candy. Since 1952, UNICEF has sponsored this fundraising event, collecting more than $118 million since. Children will often dress in a Halloween costume, such as a witch or a ghost. They may choose instead to dress of as a fictional or real figure they admire. For example, they may choose to emulate figures like Batman and Abraham Lincoln rather than something with an evil theme. Many groups, especially children, will tell ghost stories on Halloween. The first poltergeist was reported in Germany in 856 CE. Pliny the Younger, a Roman statesman, was known for telling ghost stories within his letters. In the theme of a festival, carnival-esque gamers were held, many with pagan origins, bobbing for apples, not tossing peels over your shoulder. Activities related to divination or ghost hunting. Those interested in this aspect may hold a séance or explore haunted houses. Recreational activities like hay rides and corn mazes or pumpkin carving is very popular. Pumpkins are usually carved using simple templates or may be more elaborate designs from expert carvers. The Chinese celebrate the Festival of the Hungry Ghosts, or Yue Lan. Rather than trying to hide from and disguise themselves in order to ward off evil spirits, the Chinese give them gifts in order to give them enough comfort to retreat. Halloween, or Samhain Night, is popular in Ireland. The Irish will light bonfires, just as ancient Samhain festivals would. Observers will decorate houses with turnips, candles, and carved pumpkins. Emergency services see their busiest day of the year on Halloween, as many youths are up to mischief and many celebrate with fireworks although they are banned. The Scottish take pride in their Halloween festivals, lighting bonfires according to their Samhain roots. Some may observe divination rituals. A popular ritual is dooking, where a person must be blindfolded before attempting to eat a piece of pastry hanging from a string. Japan celebrates the Bon Festival, a Buddhist holiday that honors the deceased, especially the ancestors of the observer. This is commemorated with outdoor festivals, grave visits, and grave cleaning. They will light lanterns to flow down bodies of water, symbolic of the spirits returning to the underworld. Romanians celebrate the story of “Dracula” on Halloween. They believed that he came to haunt the towns form time to time, staying in the area because he was attracted to the environment where many witch trials took place.